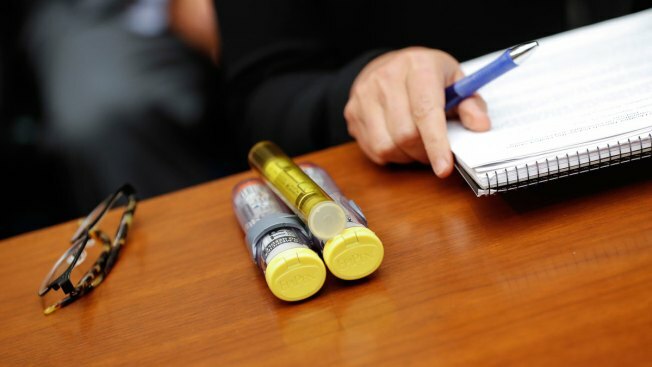 In this Sept. 21, 2016, file photo, EpiPens brought by Mylan CEO Heather Bresch are seen on Capitol Hill in Washington as she testified before the House Oversight Committee hearing on EpiPen price increases. The Food and Drug Administration said Tuesday that people can use some expired EpiPens for a few months longer to help cover spot shortages that have put some parents into a panic at the beginning of a new school year, NBC News reported. Some batches of the devices, which inject lifesaving medication to stop severe allergic reactions, can be used for four months beyond their expiration, the FDA said. The affected devices hold the 0.3-milligram dose. The FDA said it reviewed data from Mylan, which sells EpiPen, showing that the product is still effective beyond the expiration date. "We are doing everything we can to help mitigate shortages of these products, especially ahead of the back-to-school season," the FDA’s Dr. Janet Woodcock said in a statement.